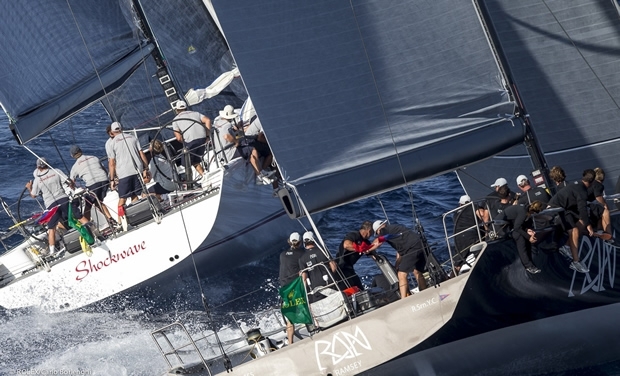 After yesterday's layday, action resumed at the 2013 Maxi Yacht Rolex Cup. While the results in some of the classes are almost finalised, competition in others, including the Mini Maxi Rolex World Championship, continues to intensify. Today, the 37-strong fleet was put through its paces in stifling heat but in the best winds seen all week, getting up to 18 knots at times. The Mini Maxi and Wally classes were sent off on two windward-leeward races. The remainder of the fleet completed a 31 mile coastal course taking in the Maddalena Archipelago. Today's winners were: Bella Mente (USA) with a second and a third in the Mini Maxi Rolex World Championship; Rainbow (NED) in J-Class; Morning Glory (GER) in Maxi Racing; Altair (ITA) in Maxi Racing/Cruising; Nilaya (GBR) in Supermaxi; and, J-One (GBR) with a first and a third in Wally. Class leaders after three days of racing are: Shockwave (USA) in the Mini Maxi Rolex World Championship; Velsheda (GBR) in J-Class; Highland Fling (MON) in Maxi; Altair in Maxi Racing/Cruising; Nilaya in Supermaxi and J-One in Wally. In the Mini Maxi Rolex World Championship, the rest day provided time for reflection as the crews contemplated contrasting fortunes during the week's first three races. Going into day 3, Andres Soriano's 72ft Alegre (GBR) enjoyed a narrow lead at the top of the standings. "Competition is very tough and anything can change," warned Soriano shortly before docking out. In an erratic day weather-wise, Alegre endured a difficult time. Losing ground in the first race following a penalty, and in a race characteriwed by dramatic windshifts on each leg, she eventually finished 11th as the Mini Maxi racer/cruiser Wallyno, benefiting from a sudden right shift, claimed a shock victory. Crews had to sit patiently for Race 2, delayed while the Race Committee waited for the breeze to stabilise. In the second race, Alegre made a small improvement registering fifth place. Alegre's misfortune opened the door for George Sakellaris' 72ft Shockwave, starting the day in second place with an already impressive 3,1,3 on the scoreboard. "Coming into this event we knew our boat is a little bit older than the others," revealed tactician Stu Bannatyne. "We're not quite as big and powerful as some of the newer boats so we try set the boat to go well in light to medium conditions which fortunately is what we've had so far and with some nice clean starts we've been able to sail our own race." While far from perfect today, a sixth and a third for Sakellaris's crew was significantly better than most of her rivals and propels her to the top of the championship with two days to go. Best performing Mini Maxi was defending champion Bella Mente which began the day stacked back in fifth place and 13 points behind the leaders. "The week started off not quite to plan," explained crewman Mike Sanderson. "Our Achilles heel is always winds under eight knots and straight out of the box on the first day of competition we got a six to seven knot coastal race and didn't have greatest of first beats and got pushed further and further back. As defending champion everyone was keen to pick up on us quite early in the regatta." The Bella Mente crew was determined to put things right today. "Its going to be a long and uphill battle for us. All we can do is pin our ears back and try and win every race from now on," continued Sanderson. As the fastest Mini Maxi on the water in both races, enough for a second and a third place on corrected time, Hap Fauth's crew on Bella Mente are back in contention, now nine points behind leaders Shockwave. Niklas Zennström's two-time World Champion, Rán 2, third at the start of day and just one and a half points off the leader, probably endured one of her worst days ever in Porto Cervo: a tenth and a seventh has left her in third place with four and a half points to recover. Zennström's crew have shown before they have the determination and skill to pull things around. In the other classes, Hasso Plattner's Morning Glory closed the gap on Lord Irvine Laidlaw's Highland Fling in Maxi Racing to one point. Rainbow narrowed Velsheda's advantage in J-Class by the same margin, after winning today's race. Otherwise, Nilaya in Supermaxi and Altair in Maxi Racing/Cruising have all but sown up the competitions, maintaining perfect scores. In the Wally class, Jean Charles Decaux's J-One enjoys a five point lead over Sir Lindsay Owen-Jones' Magic Carpet 3 (GBR). Tomorrow, the penultimate day of racing, is likely to be a defining day in this Class.